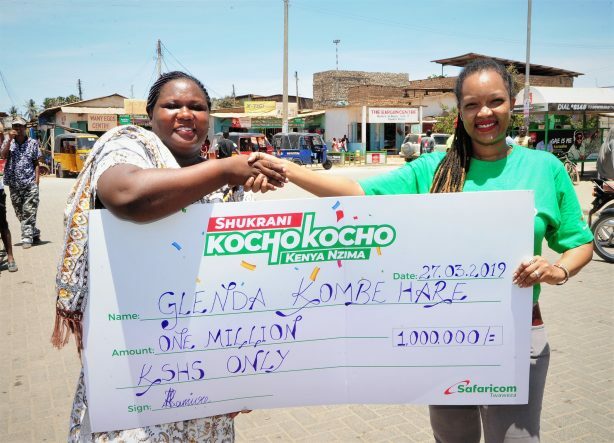 Glenda Kombe Hare aged 28 and a matatu conductor from Malindi town is among the newest Millionaires in the ongoing Shukrani KochoKocho consumer promotion. Based at the Malindi bus stop, her work involves assisting passengers to the right shuttles, collecting bus fares and issuing tickets. Her matatu is registered under Alwahim Sacco Society. The mother of one says she had a tough upbringing characterized by lack of basic needs. She attended school to Form Four and despite good performance in her KCSE exams, she did not proceed to college due to lack of school fees. An equal fate befell her five siblings. She has been married for three years to a matatu driver, and she says Shamim, their one-year old daughter has been their sunshine in their life. Glenda’s win opens a promising future for her family. She plans to purchase a taxi for her husband and start up an Agrovet stocking fertilisers and other livestock products in Malindi town. She believes it will be a great stepping stone to a successful future. “My life hasn’t been smooth and easy. As a child, I grew up missing out the lifestyle many of my age mates enjoyed and this status affected my personality and education. I ended up being a conductor to earn a living and provide for my family. It is a tough life and a rough job. I will invest in a taxi business for my husband so that he can be his own boss. I also plan to invest in an Agrovet that stocks in fertilisers, veterinary drugs and other livestock products in Malindi town. I thank Safaricom for celebrating me as a customer,” said Glenda Kombe Hare. Other week four millionaires include: Sila Kigen, a primary school teacher from Elgeyo Marakwet, Rift Valley; Barwaqo Abdi Osman from Garissa, North Eastern; Julius Nyerere Ogondah from Nyanza – works at the Immigration department – Eldoret branch; Elphas Kimutai Bett, a businessman from Kakamega, Western region and Wilson Waitwika Kamau a craftsman from Gilgil town, Central region. Nairobi and Eastern winners will be announced in the coming week once the winners are reached. The promotion enters its fifth week and has so far seen more than two million customers from across the country awarded with weekly cash and daily airtime prizes worth millions of shillings. The promotion is designed to have weekly draws for each of the eight regions to reward customers. In addition, more than 500,000 customers are expected to win cash prizes of KES 1,000 and above while more than 5 million other customers stand to win daily airtime prizes. Tax reform, digitisation key to fin...Is your business ethics ready?